I want to share recipe of beautiful breakfast, which like all members of family – checked! I saw recipe of pudding with oatmeal and curd on TV. So I decided to cook it, with my additions of course. I love doing this yummy for breakfast. Even my husband like it. This is a great alternative for fans of oatmeal (not always eat the same porridge). Also option for those who do not like oatmeal — sweet and useful. 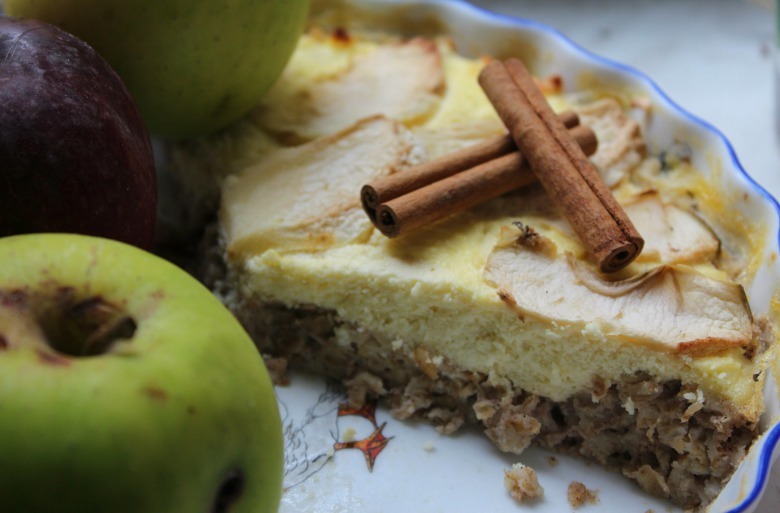 I do not do exactly as was indicated in recipe, without adding sugar and caramelized apples. I prepare diet interpretation. 1. Pour oatmeal with hot milk. Approximately one to one. Milk should cover oatmeal. Leave until cooling. It should cool completely. This is an important step! 2. Mix curd with yolks, vanillin, add sugar, if desired. 3. Mix cold oatmeal with whites, add sugar if you want and add seeds. In TV show was added pumpkin seeds — really tasty! Also I like to add some ground roasted nuts or sunflower seeds — with it more delicious. At least for me. 4. Spread in prepared form. You can make servings, or big one for breakfast of whole family. Actually, I did so. 5. Top with apple slices. In the TV show it was covered with caramelized apples. Usually I do not like so. I like more with honey already during breakfast. 6. Bake for 30 min at 175℃. Be careful not to over bake. With gluten from the finished product oatmeal keeps the shape well even without auxiliary flour or starch, so it is prepared fast — perfect for breakfast. Baking is really tasty, useful and nourishing. Top of recipe "Breakfast pudding from oatmeal and cheese"
Цікавий рецепт, має бути смачно!